The role of pets in the lives of the aged is particularly significant for those who live in a nursing home or in some situation of assisted care. Numerous studies show pets provide one of the few interventions capable of permanently lifting the atmosphere of hospices and nursing homes. Despite all this evidence, many nursing homes still do not allow pets, and fear of giving up their animal companion is a serious concern for many in the community. For older people still living in their own home, pet ownership has many benefits including social facilitation and companionship as well as increased activity levels. 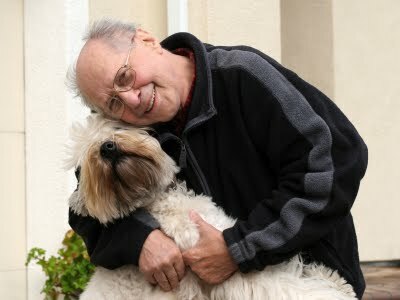 Research indicates that people over the age of 65 are the least likely age group in the community to own a pet. Yet, in many ways they are the age group that has the most to gain from pet ownership. Better solutions are needed to ensure older people can enjoy the many benefits pets provide. Never fear - help is out there! Aged care operators are recognizing the benefits of pets, with some allowing owners to take their pets with them. There will be rules and some pets are not appropriate in some circumstances. If you have more than one pet, you could ask if you can bring more than one. You may also want to ask whether you may get another pet if your current pet passes away. Useful information about aged care accommodation that allows pets can be found in DPS guides or see contacts below. When making enquiries, be ready to explain the benefits owning your pet has for you. Give accurate information about your pet(s) including type, size, age, behaviour, whether desexed (vet certification is probably required) and any vaccinations. If you have to move and are unable to take your pet with you, you do not have to euthanize your pet. There are other options. Contact an animal shelter (RSPCA: 02 6287 8100) or a local rescue group (such as ARF: 0421 216 485). They may be able to assist with rehoming advice. Alternatively, check online to find out if your breed of dog has a special rescue group. If you are likely to experience the loss of a pet, or have to part with one, your vet can discuss the issues with you before this happens. If required, Lifeline provides 24/7 crisis support on 13 11 14. Alex & Barney find suitable retirement home through daughter's doggedness! The problem of finding Alex a home was complicated by his initial reluctance to leave his unit and the fear that he might have to give up his pet dog, Barney, a six-year-old Jack Russell-cross. pet are same like a family member and they also want to love and care them. Retirement Villages Adelaide is the best Retirement Assisted Living package and Retirement facility in Retirement Villages south Australia. We are largest providers of quality lifestyle. Mostly old people love dogs that,s way they care too much. 10 Fruits & Vegetables That Dogs Absolutely Love!